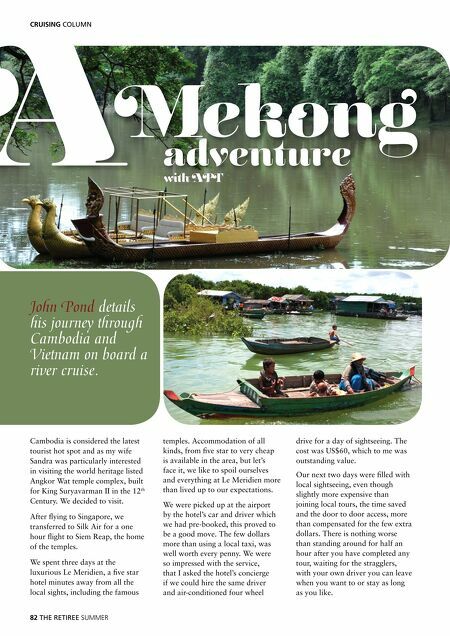 CRUISING COLUMN AMekong adventure with APT John Pond details his journey through Cambodia and Vietnam on board a river cruise. 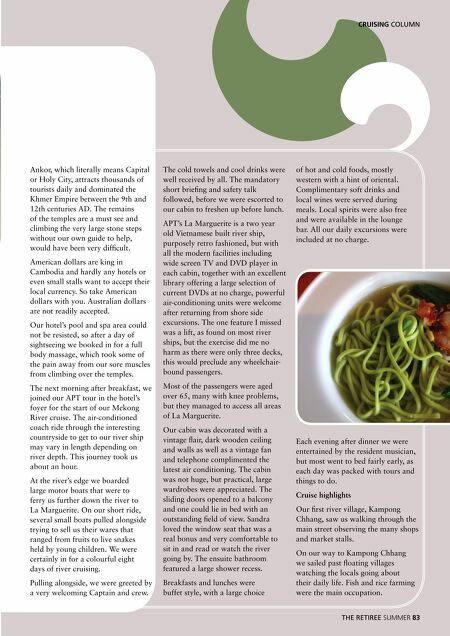 Cambodia is considered the latest tourist hot spot and as my wife Sandra was particularly interested in visiting the world heritage listed Angkor Wat temple complex, built for King Suryavarman II in the 12th Century. We decided to visit. After fl ying to Singapore, we transferred to Silk Air for a one hour fl ight to Siem Reap, the home of the temples. We spent three days at the luxurious Le Meridien, a fi ve star hotel minutes away from all the local sights, including the famous 82 THE RETIREE SUMMER temples. Accommodation of all kinds, from fi ve star to very cheap is available in the area, but let's face it, we like to spoil ourselves and everything at Le Meridien more than lived up to our expectations. We were picked up at the airport by the hotel's car and driver which we had pre-booked, this proved to be a good move. The few dollars more than using a local taxi, was well worth every penny. We were so impressed with the service, that I asked the hotel's concierge if we could hire the same driver and air-conditioned four wheel drive for a day of sightseeing. The cost was US$60, which to me was outstanding value. Our next two days were fi lled with local sightseeing, even though slightly more expensive than joining local tours, the time saved and the door to door access, more than compensated for the few extra dollars. There is nothing worse than standing around for half an hour after you have completed any tour, waiting for the stragglers, with your own driver you can leave when you want to or stay as long as you like. After prostate cancer comes the good news – getting your life back! ‘Tis the season to go caravanning!